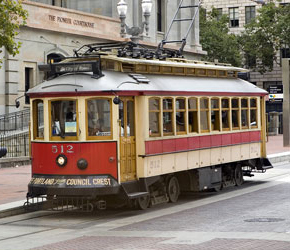 The TriMet board of directors today approved two Vintage Trolley cars to “clang, clang, clang” their way to the St. Louis Loop Trolley Transportation Development District. The opening line of “The Trolley Song” from the 1944 film Meet me in St. Louis helps set the stage for the cars to become part of a new heritage streetcar project in St. Louis called the Loop Trolley. Vintage Trolley car 512 and 511 will be heading to St. Louis as part of a new heritage streetcar project. In August, representatives of the Loop Trolley contacted TriMet expressing interest in utilizing the Vintage Trolley cars for operation on their new streetcar Loop Trolley Project. The Vintage Trolleys operate about eight Sundays a year and are parked at the Trolley Barn maintenance facility located at the Rose Quarter Transit Center. Transferring them to the St. Louis project will put them in daily use on a new heritage streetcar line that is a centerpiece of revitalization efforts for St. Louis’ Loop Business District. The transfer also provides other benefits to TriMet. TriMet will repurpose the Trolley Barn maintenance facility into a MAX Maintenance of Way (MOW) facility to improve maintenance and response time for crews. Current MOW crews who do much of their work in central Portland will report to this repurposed facility, rather than being based out of facilities in Gresham and Beaverton. The Loop Trolley will pay for all of the costs to transport Vintage Trolley cars 511 and 512. Once the cars begin running, the Loop Trolley will pay $80,000 to TriMet to retire the remaining local interest share. The transfer agreement between the Loop Project and TriMet requires that the vehicles be well maintained and also allows for the potential for cars 511 and 512 to return to Portland after 10 years. Vintage Trolleys have a long history in the Portland region. In 1987, TriMet, Vintage Trolley, Inc. (VTI) and the City of Portland entered into an agreement to establish a Vintage Trolley system that would operate on TriMet’s newly opened MAX light rail line. Local and federal funds were secured to purchase Vintage Trolley cars #511 and #512, and construct a maintenance and storage facility at the Rose Quarter. Vintage Trolleys began operating on weekends on Nov. 23, 1991 between Lloyd District and SW 11th Ave. Later two other Vintage Trolley vehicles (#513 and #514) were purchased with local funds. As the MAX light rail system continued to expand, it limited the frequency of trolley service. Since 2011, Vintage Trolleys have operated along the Portland Transit Mall about eight days a year: Sundays closest to Memorial Day, July 4 and Labor Day, plus Sundays between Thanksgiving and Christmas. The vehicles will move to St. Louis in mid-2014, so riders will still be able to take in a few more trips before then. Vintage Trolley cars 513 and 514 are dedicated to service on the Willamette Shore Line. As federal funds paid for 80 percent of the cost of the original cars, the Federal Transit Administration (FTA) is required to approve the transfer. FTA has committed $25 million to the Loop Trolley project.